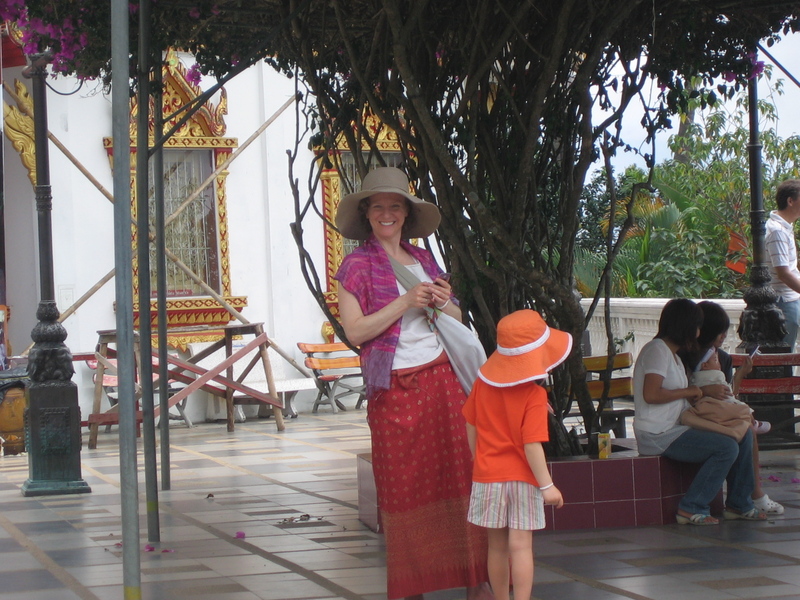 In the first few days of Rainy Season Lent, I took the children to Wat Doi Suthep, the holiest site in the north. The temple sits on the top of one of the mountains ringing the city. The terrific legend about the founding of the temple goes something like this: an ancient king possessed the precious relic of one-half of the Buddha’s shoulder bone. In search of an appropriate site to house this relic, he tied it to the back of a royal white elephant, who was then released into the jungle. The elephant climbed the mountain, trumpeted three times, and dropped dead. Thus the site was chosen. We can just see it from our apartment balcony, a tiny gold triangle sparkling on the green mountainside. 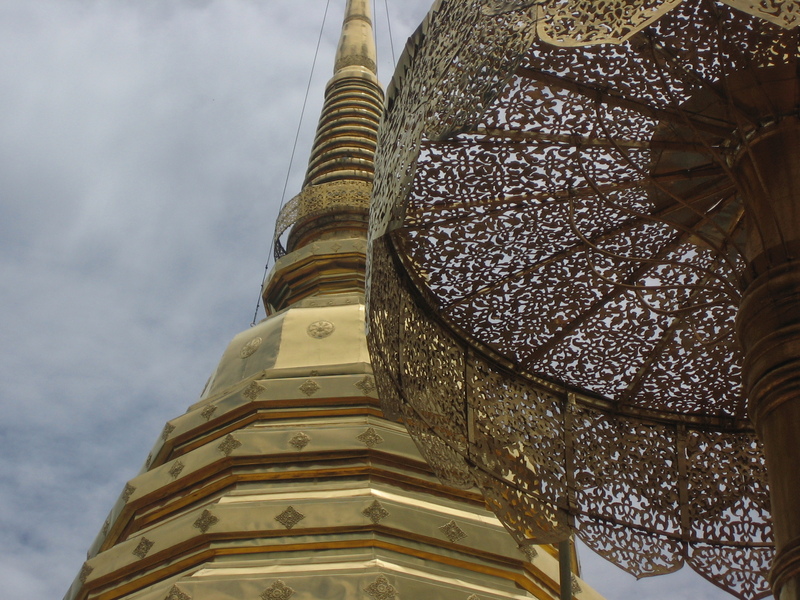 Given the season, the temple was unusually busy, with monks in full action. In one shrine, one was in sitting meditation, completely still, eyes gazing motionless ahead of him, even as visitors knelt at his feet and made offerings to the Buddha next to him. In another, a monk was offering blessings, but was making very clear distinctions between what kind of blessings he offered to whom, determined first by whether the seeker was Thai or foreign, or whether they were demonstrating proper temple etiquette in their clothing and bodies. Given that we were properly dressed (I rented a sarong from the Buddhist equivalent of the Girl Scouts, since I thought my skirt was a bit too short for this wat) and that the children love managing their kneelings and feet directions in front of Buddha images, I thought, heck, let’s go for it. So we joined the worshippers, moving ourselves forward on our knees until it was our turn. Camilla was summoned first, with me kneeling behind her, prompting her to wai with her hands folded at forehead level, rather than under her chin (as you would for ordinary lay people). “Bay,” the monk said to me. Confused, I smiled at him. He takes a piece of white sacred string, the sai sin, knotted by the heavily-tattooed lay assistant next to him, and ties it around Camilla’s wrist, murmuring at her in Pali. Our temple etiquette rated us sai sin and Pali, but not a sprinkling of lustral water. Then it is Ascher’s turn, and then I move forward. “No woman,” he says sternly to me, and the lay assistant gestures for me to come to him instead. In thinking so carefully about how our feet were pointed and keeping the level of our head below that of the monk, I’d completely forgotten one of the main tenets of monk etiquette: they do not touch women. As in, they do not even brush by them on public transportation, if they can help it. Then I realize what he meant with Camilla. Confused by her relatively short hair and boyish clothing that day (she was wearing a JCC t-shirt, which I enjoyed), he was asking me if she was a boy, and, taking my confused smile for a “yes,” touched her wrist. I did not clarify the situation. How much spiritual pollution can be contained within a four and a half-year-old girl? 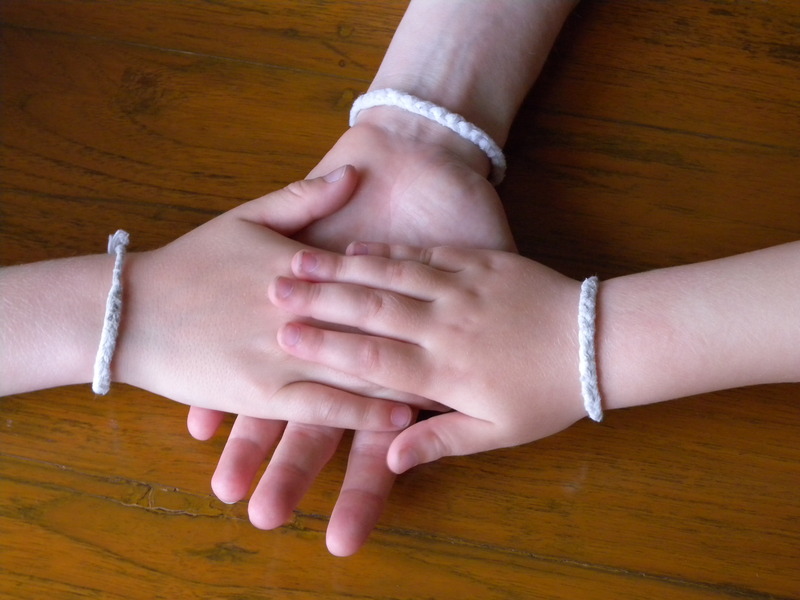 The lay assistant tied the braided string onto my wrist, explaining to me that it would bring me good luck, and protect me. In the north, sai sin are also travel amulets, and are traditionally tied around the wrists of people by monks, friends, or family before they begin a journey. Photo courtesy of Ken, who appreciates being credited. It seemed right that we three travelers had been given these sacred strings as we began to settle down here in Chiang Mai. Ken was tickled to see them when we returned home, and then delivered what I consider the down side of the sai sin: it’s also considered terrible luck to cut them off, and that to secure their blessing, and to avoid madness and accident and other awful fates, one must allow them to wear completely down and fall off. These particular sai sin are made of particularly strong thread, and braided thickly in the middle. I’m afraid I’ll be wearing a dingy gray, slightly sour-smelling string on my wrist for the entirety of our stay here, if not longer. But I am more afraid of the consequences of cutting it off. Go Camilla. You’ll be polluting men years from now.